As 2020 prospects go the Midwest has their fair share of elite national caliber guards and high major programs from coast to coast are filling up their recruiting trails. One such talent who fits that narrative is Adam Miller of Morgan Park High School in Illinois. A 6-3 175 pound guard, Miller is a top 25 national caliber guard whose momentum was slowed a bit due to injury this past spring. He started to get healthy during the summer and his play followed. Now completely healthy look for Miller to continue to push towards a top 15-20 national ranking over the next 8-12 months as he’s primed for a big year this winter. 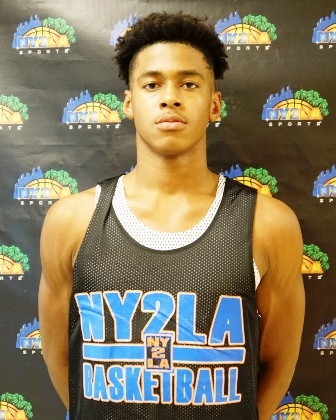 Equipped with size, length, athleticism, and instincts for the position, Miller at his best is a multi-dimensional guard with the ability to create and score although the ladder is one of the things he does best. His perimeter stroke extends beyond the arc and he has the ability to rip the nets with the mid-range pull up as well. His handles let him break down opposing defenders off the bounce and give him the ability to do so with a purpose to create or score through traffic. Miller’s best basketball lies ahead and big named programs have taken notice. He holds offers from Kansas, Illinois, Northwestern, Louisville, Arizona State, Memphis, Oklahoma State, Texas Tech, UCLA, and Wake Forest. Having had his national leap forward with the spring injury, Miller is now healthy and he’s firmly positioned to be one of the most discussed and coveted 2020 prospects in the country moving forward. He plays with the Mac Irvin Fire program during the grassroots travel season.